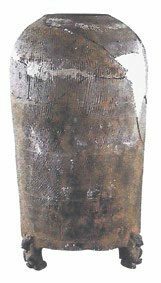 A large cylindrical pottery model of a granary supported on three bear-form feet. The granary’s domed top has a central aperture, which is surrounded by a lipped rim. The straight sides are mainly undecorated, save for five sets of three horizontal linear bands, which are incised into the main body. Each of the bear-shaped feet is moulded in minute detail with bulging eyes, full mane and upper limbs. The grey pottery jar is burnished, giving the material an iridescent silvery sheen. Pottery made during the Han dynasty provides a valuable insight into the social and financial context of China. 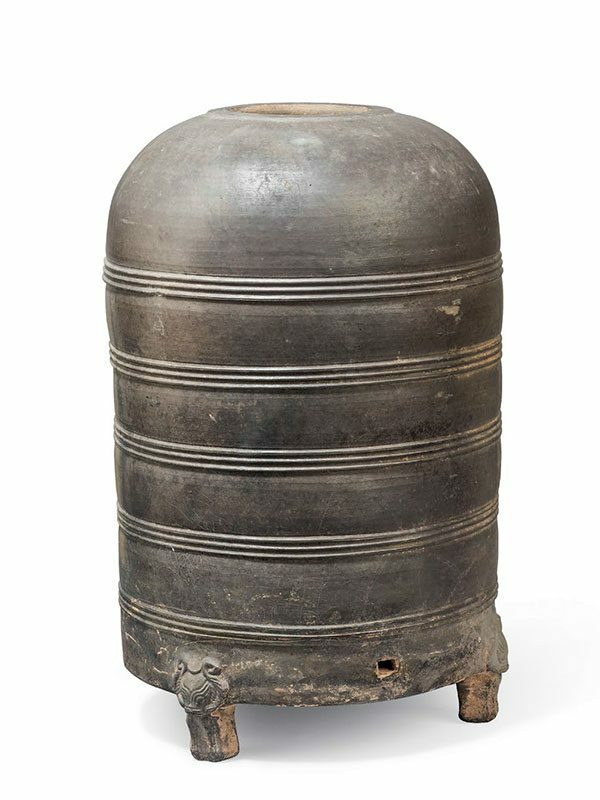 This unusually shaped earthenware jar reflects the ideal of comfortable living in the agrarian society of the time, and granary jars used to store grains were a symbol of wealth. Such jars were made as part of a larger group and sometimes bore the name of the crop, to help identify the contents. Granary jars supported on bear-form feet are not unknown in the Han dynasty, since bears symbolise bravery and strength. According to Welch, “bears seem to have been very popular figures in the Han zoomorphic repertoire but were little used thereafter.” A closely comparable granary jar with a pale green glaze, formerly in the Charles B. Hoyt collection, is now in the Museum of Fine Arts, Boston. 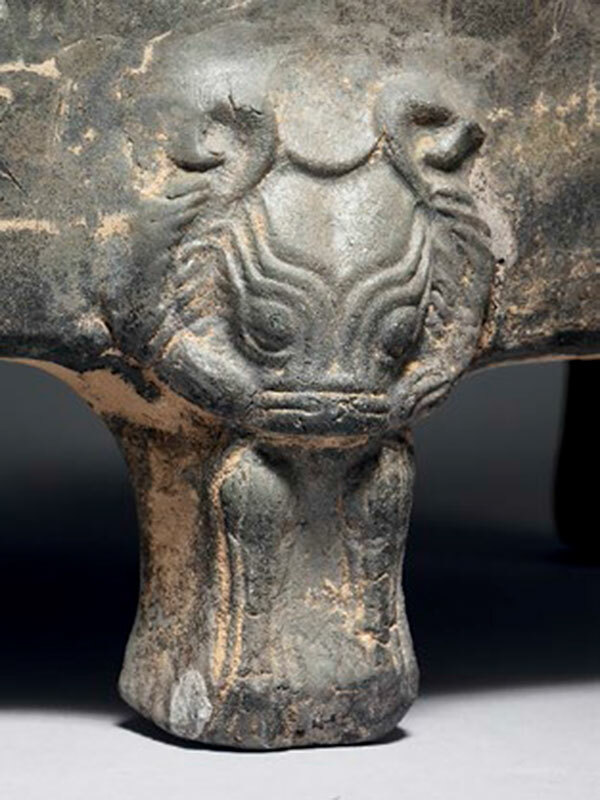 Another comparable granary jar with more naturalistic bear feet and cord-impressed decoration was discovered in 2003 in a mural tomb dating to the Xinmang regime (9 – 23 AD) in Yintun, Luoyang province (fig. 1).